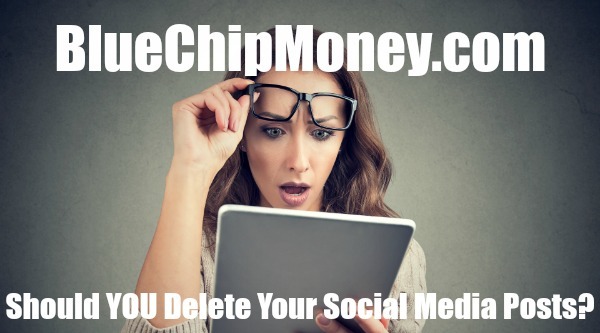 Millennium 7 Publishing Co.: Should YOU Delete Your Social Media Posts? Should YOU Delete Your Social Media Posts? To delete, or not to delete: That is the social media question.. I've been a social media professional for 11 years now, and if you ask anyone I've worked with you'll likely hear stories of times I've raised my voice and yelled something to the effect of, "No! We do not delete!" Deleting indicates we have something to hide! I still believe that. If you post something and then delete it later, it's because you don't want someone to see it. But that makes zero sense because then you should never have posted it in the first place. But things have changed. Social media has changed. Now we scrub our social media accounts to find the most offensive stuff and hope no one has seen it. Truth is, no matter how fast you are, someone else is faster. This should never be a thing you worry about, but in case it is, it's my job to help you make an informed decision. If you posted something 10 years ago that you don't want people to see & maybe it's offensive or maybe it's just outdated & a clean slate sounds wonderful. If being offensive is something you are dealing with, use this as an important teachable moment. I've written repeatedly about something I coined years ago called "The Grandma Test": If it's something you wouldn't say to your grandmother, it doesn't belong on social media. While that sounds pretty strict, you won't be thinking that the next time you are questioning whether or not to delete posts. And please note: If you made it a habit of posting offensive content at any point in your social media history, you don't deserve a clean slate. You deserve to be scolded. But better to be scolded by me than a friend or, worse, an employer. Con For Deleting: What Are You Trying To Hide? That sigh of relief that comes with getting rid of content also comes with a stigma that you're trying to hide something. If it's truly a matter of spring cleaning, then fine. You'll likely need to convince some folks, but that's OK. I didn't always feel this way, but as hundreds of social media posts turned into thousands and then tens of thousands and more, keeping the store in order gets more difficult by the day. The social platforms haven't really given us a way to organize, and until they do, a little spring cleaning may be the next best thing. But depending how much you have to delete, you could draw unwanted attention. Say you went through a period when all your posts weren't your best. If it occurred over a 6-month span, you could end up with a missing 6-month block of content. Much like that weird gap in a resume that makes employers and recruiters wonder what happened, this could raise red flags for people who lean on your every word. As far as how to go about deleting posts? A quick search will reveal all kinds of third-party services (mostly paid, a few unpaid) that will delete them automatically. But use those with extreme caution, as some will automatically tweet that you are using the product to delete. When you give the program access to your account, you agree to this. Even though deleting can take time and effort, it might be worth it to do it on your own terms. Also consider a blog post explaining what you are doing. If I decided to delete a bunch of my social media content, this is the route I would take. I believe transparency is vital in social media and any type of digital communication, whether it's on my Twitter feed or website. Of course, if you are deleting because you have something you want to hide, you may not consider this the best of advice. But in general, being up-front with the people who trust you is a great trait. Guest Authored By Scott Kleinberg. Scott was born in Brooklyn, grew up in New Jersey, went to college in Pittsburgh, spent 11 years in Chicago and then finally moved back to Brooklyn to be InvestmentNews & social media and engagement editor. He's been a journalist for more than 20 years, working at newspapers big and small in nearly every role from reporter to editor to designer to columnist to online, and, most recently, social media manager. Some of his proudest social media moments include being followed on Twitter by Jimmy Fallon, Yoko Ono and Melissa Joan Hart, and being called a nobody (in the best way possible) by William Shatner. Scott has also been a fixture on Chicago radio talking social media and internet trends. And he taught students on the university level as a guest lecturer. Scott and his wife were married during a Pirates-Cubs game at PNC Park and are proud puggle parents, enjoying long (leashed) walks in the park. Follow Scott on Twitter.